Mix semolina, rice flour, green chilies, onion, curry leaves, a pinch of hing, sodium bi- carbonate, and salt in a vessel. Add buttermilk to the above and make a batter of medium consistency. Now add finely chopped coconut and cashew nut to the batter. Leave the batter for at least 1 hour. Grease a non-stick griddle with oil. Pour a large spoon of batter over it. Spread the batter by swirling the griddle. Pour 1 tbsp of oil on and around the dosa. Cook till it gets crisp and golden in color. Roll it in a cylindrical form and remove it from the flame. 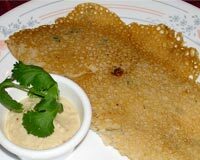 Rava Dosa is ready to eat. Serve it with coconut chutney.